Most of us think of massages as a relaxing experience following a heavy day at work, session at the gym, or perhaps as part of a luxury spa treatment. While massages clearly tick the boxes when it comes to relaxation, they’re also incredibly good for your health as well. In addition to these plus points, there are a few specific scenarios where massage therapy will make a significant and noticeable impact. Exercise is clearly beneficial to our health in a variety of ways – unfortunately, muscle injuries often prevent us from keeping active. 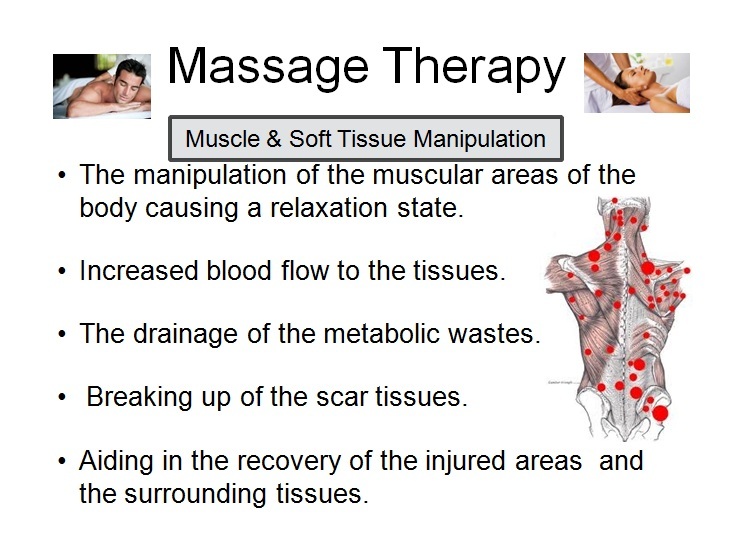 Massage therapy can help mitigate the effect of injuries by preventing them altogether as well as speeding up recovery. It is no surprise professional athletes have incorporated massage therapy as part and parcel of their routines. According to a study from the University of Illinois at Chicago, massage therapy improves circulation and also alleviates soreness as a result of exercise. Regardless of the level of physical fitness, the group that received massages only experienced soreness for 90 minutes after exercise. The control group with no massage therapy? 24 hours. Massage therapy isn’t a one-stop solution to issues with posture, but it is effective in helping your muscles become more responsive to overall treatment. As part of a comprehensive posture correction process, massage therapy is a key component. Massages for the elderly are specifically tailored, using a more gentle application of traditional techniques. Oils are also used more frequently in order to reduce friction. Geriatric massage therapy not only relieves stress in patients, but it also helps specific medical conditions. Massage therapy has been shown to be specifically effective in the treatment and management of age-related diseases and conditions. Many studies have shown demonstrable improvements, with patients seeing the effects both in the short-term and over time. For example, research has shown that massage therapy can positively impact those with Alzheimer’s disease. Slow-stroke massage, for example, greatly reduces expressions of agitation and distress. Massages have also led to relaxation responses in patients with dementia. The reduction in signs of stress not only improves the quality of life in patients, but also helps caregivers in their role. Studies have shown that aging occurs more quickly in those who do not engage in physical activity or mental stimulation. Geriatric massage therapy services often make the extra effort of talking to patients and focusing on stretching. This means that both the mental and physical aspects are covered, giving elderly patients exactly what they need to remain fit and mentally active. Stretching in particular is helpful in retaining a good range of motion, giving greater strength to specific muscle groups, and also lowering patient tension. Patients that have massages as part of their treatment routines also report a better night’s sleep, more energy during the day, and a general feeling of wellbeing that’s otherwise not had. When it comes to slowing down the aging process, massage therapy is a fantastic option. Alongside NSAIDs and exercise, massage therapy forms a powerful combination option for the elderly. As long as the massages are geared specifically towards this age group, the benefits are multiple. Not only that, it’s a treatment option that is low-cost and carries no risk compared to some medications. As all of us who have been through a pregnancy know, an effective treatment against stress is given the red carpet treatment. With a ballooning body, agonising changes in mood and feelings of wellbeing, and discomfort from muscles you didn’t know were there, massage therapy can help those nine months be a little more bearable. Carrying a child changes the mother’s centre of gravity, putting additional stress on the back, shoulders, neck and abdominal muscles. Joints are also less stable due to a relaxation in the mother’s ligaments. Most women therefore experience a noticeable back pain after a few months of pregnancy. Massage therapy can offer relief from pain, with a prenatal massage therapist being trained to pinpoint the spots that mothers tend to suffer from. In addition, the therapist will also know how to avoid putting any undue stress on your body or the child inside you. Considering the fact that you are not able to lie down on a massage table while you’re pregnant, many women opt out for a massage chair. Even though they can not replace a proper therapist, massage chairs are very good at relieving pain. When women are pregnant, stress is a very common thing to experience. And massage therapy can combat this by increasing levels of dopamine and serotonin, which are known as the ‘feel-good’ hormones that improve our moods and outlook. Not only that, massage therapy also battles levels of cortisol, which is an indicator of heightened levels of stress. By the combination of the two, you should see a noticeable improvement in your overall mood and feeling of wellbeing. While massage therapy is obviously not a substitute for modern cancer treatment options, it’s nevertheless an effective ally in managing symptoms, improving quality of life, and reducing stress. That in itself makes it worth adding massage therapy to the treatment arsenal. Studies carried out in the UK were analysed in a 2009 review, showing that massage therapy can help with the management of symptoms. In 2011, a review of massage therapy for breast cancer showed that it’s a legitimate supportive treatment. While some studies were not fully conclusive in certain purported benefits, it’s nevertheless encouraging – and we also can’t deny the clear feeling of wellbeing that patients feel following a massage session. Massage therapy is more than just going to a spa for a rubdown or using a massage chair at home for a bout of relaxation after a busy day at work. While massages are obviously great for loosening those muscles and giving a bit of stress relief, they offer so much more than that as well. The clear medical benefits have been shown countless times in medical studies and when used in conjunction with other proven treatments the results will be more than satisfactory.